'So Damn Much Money': The Influence Of Lobbyists When former DNC Chair Robert Strauss said, "There's just so damn much money in it," Robert Kaiser knew he had a title for his book on the multibillion-dollar world of political lobbying. Robert Kaiser is the ultimate Washington insider. As he once told one interviewer, he was "part of 'inside the beltway' Washington before there was a beltway." During his 46-year career at The Washington Post, Kaiser has covered Congress, the White House and national politics. He has also served as both managing editor and national editor of the newspaper. 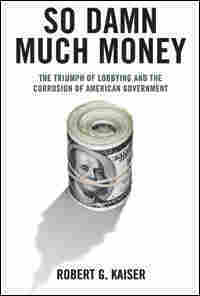 Now an associate editor there, Kaiser displays his keen understanding of how Washington works in a new book, So Damn Much Money: The Triumph of Lobbying and the Corrosion of American Government. But Kaiser says even he did not really know how lobbyists operate before he began working on this book. 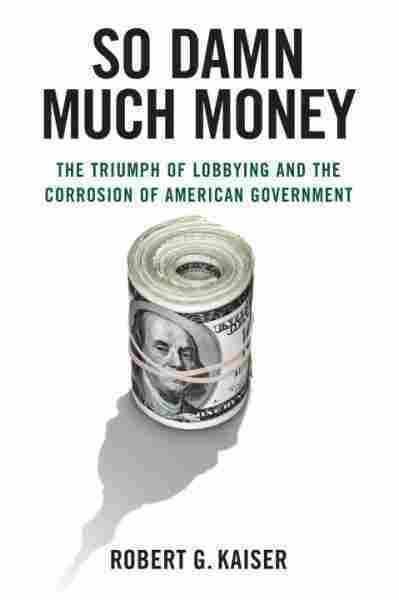 So Damn Much Money explores how lobbying has grown in influence and changed the way things work in the nation's capital through the story of Gerald Cassidy. Cassidy's life story, says Kaiser, is reminiscent of F. Scott Fitzgerald's Jay Gatsby. Cassidy's vivid memories of growing up poor in Brooklyn and Queens helped fuel his drive to get rich. "I'm a big fan of financial security" he says. A liberal Democrat, Cassidy came to Washington in 1969 wanting to help feed the hungry. In the end, he built a powerful and profitable lobbying firm with an income of some $33 million in 2003. Cassidy & Associates was the first lobbying firm that tried to go public by selling shares on the stock exchange. That meant the company had to document its business dealings for the Securities and Exchange Commission. While reporting on lobbying for the Post, Kaiser came across these documents. At the time, Cassidy's firm was the biggest in town, and Kaiser seized the opportunity to learn everything he could about Cassidy and the business of lobbying. The result is a remarkable look at how lobbying, a legal and legitimate activity, has helped create what Kaiser calls a "corroded culture" in Washington. Even as President Obama has vowed to change that culture, Kaiser shows how difficult the task may be. With lobbyists helping to fund campaigns that cost millions of dollars and former government officials earning millions by peddling their influence, the business of lobbying is now deeply ingrained in the workings of our government. This reading of So Damn Much Money took place on Feb. 4 at the Politics and Prose bookstore in Washington, D.C. This was a seductive come-on in a city where making money was in vogue, and the story lived up to the enticement. The Post reported startling details about the exploits of a lobbyist named Jack Abramoff, then forty-six, and a public relations man who collaborated with him, Michael Scanlon, thirty-three. They had persuaded four Indian tribes flush with gambling money to pay huge fees to exploit Abramoff's connections with conservative Republicans in the White House and Congress to protect the tribes' interests. At Abramoff's urging, the tribes also hired Scanlon to do unspecified public relations work. "The fees are all the more remarkable because there are no major new issues for gaming tribes on the horizon, according to lobbyists and congressional staff," reported the Post's Susan Schmidt. Abramoff persuaded the tribes that they needed his help "to block powerful forces both at home and in Washington who have designs on their money," Schmidt wrote, quoting members of the tribes to this effect. She disclosed that the four tribes had donated millions of dollars to politicians and causes suggested by Abramoff, and had changed their traditional patterns of political contributions by giving less to Democrats and more to Republicans—at his urging. "Some members of the tribes" Abramoff represented "have begun to complain that they are getting little for their money," wrote Schmidt. Neither Abramoff nor Scanlon was a household name in Washington. But Tom DeLay was, and DeLay's name appeared five times in that Post story. DeLay, a successful small businessman who ran an exterminating firm in the suburbs of Houston before he became a politician, was then the most powerful man in Congress. Everyone knew that DeLay had chosen Dennis Hastert of Illinois to become Speaker of the House of Representatives when that job suddenly came open in 1999. DeLay's title was majority leader, technically second-ranking to the speaker, but their colleagues understood that DeLay was smarter and tougher than Hastert, and more influential among House Republicans. 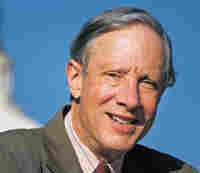 In the mid-1990s DeLay and his colleagues in the Republican leadership had struck a bargain with Washington's lobbyists that was both brazen and remarkably successful: if the lobbyists would help raise hundreds of millions of dollars to support Republicans and help preserve their majority in Congress, DeLay would invite them into the legislative process, and allow them to propose entire bills and suggest changes to legislation proposed by others. Both sides fulfilled this understanding with gusto. The Republican National Committee and the party's House and Senate campaign committees, which collected $358 million in contributions in the two years prior to the 1994 elections when Republicans won control of Congress for the first time since 1952, reported contributions of $782 million a decade later, in 2003–04—a 220 percent increase. Lobbyists and their clients helped make that possible. And lobbyists for corporate interests won countless legislative provisions from the Republican House and Senate favoring their clients. Under the accepted interpretation of the law on bribery, all of this was entirely legal. The law prohibits a member of Congress from "corruptly" seeking or accepting money in return for "being influenced in his performance of any official act." That adverb "corruptly" speaks to intent, but it speaks vaguely. "Corruptly" has no clear legal definition. Absent evidence that the political contributions directly purchased the legislative results, quid for quo, both the contributions and the favorable legislative provisions were legal. The Post story about Abramoff, Scanlon, and their Indian clients mentioned DeLay in three contexts: as a friend of Abramoff's with whom the lobbyist enjoyed "a close bond"; as Scanlon's former employer (Scanlon had been Representative DeLay's press spokesman in the late 1990s); and as one of the congressional leaders Abramoff had persuaded to defeat a proposal to tax Indian gambling earnings in 1995, when he had just begun representing Indian tribes. Abramoff used the argument then that the tribes were "engaged in the same ideological and philosophical efforts that conservatives are—basically saying, 'Look, we want to be left alone.'" With DeLay so prominently involved in this story, it quickly qualified as a scandal. Because Washingtonians tend to evaluate a scandal by the rank and power of those involved, this one looked juicy. A good scandal makes life richer and more interesting for nearly everyone in town—apart from the involved parties. The Abramoff scandal arrived with impeccable timing, after eight years of Republican control of the House of Representatives that had brought lobbying and money to the forefront of public consciousness and changed the accepted standards of behavior in Washington. The Post is the house organ of Washington's political class; virtually all its members read the paper every day. Its stories are grist for one of the world's most prolific gossip mills. On Monday morning, February 23, the Abramoff story was Topic A on Capitol Hill and across the city. On Tuesday the 24th, a Republican congressman from the Washington suburbs of Virginia, Frank Wolf, released a letter to the attorney general and the director of the FBI asking them to investigate relations between the Indian tribes and Abramoff and Scanlon. On Thursday the 26th, Senator John McCain announced an investigation by the Committee on Indian Affairs, which he chaired. The reported fees paid by Indian tribes to Abramoff and Scanlon were "disgraceful," McCain said. Now the story had legs. In a press release on March 3, Abramoff's law firm, Miami-based Greenberg Traurig, announced that he was leaving the firm. Abramoff had brought riches to his partners in the three years he had worked there, but now a member of its executive committee said Abramoff had "disclosed to the firm for the first time personal transactions and related conduct which are unacceptable." What did "unacceptable" mean? Abramoff operated in a world of huge numbers and vague standards. Lobbying in Washington is traditionally done on a retainer basis—clients pay lobbyists fixed monthly fees, regardless of the hours actually worked or the results achieved. Lobbyists are thrilled to get a $40,000-a-month client; $60,000 a month is considered a bonanza. Abramoff was charging each of his four tribes $180,000 a month. McCain and other members of the Indian Affairs Committee thought the lobbyist was committing grand larceny. "He was ripping off Indians," was the way Senator Daniel Inouye of Hawaii put it. But Greenberg Traurig hadn't complained about the size of the fees or looked very closely at Abramoff's operations until the Post story appeared. Abramoff had acquired a big reputation among his competitors for his success expanding Greenberg Traurig's lobbying practice. In 2000, the year before Abramoff brought his large "book of business" from his previous law firm, Greenberg Traurig's lobbying revenue had been about $3 million. In 2001, it shot up to $16 million, then to more than $25 million in 2003. Suddenly, Greenberg Traurig ranked fourth among the lobbying powers in town. Everyone in the business knew this was Abramoff's doing. In the lobbying fraternity, reactions to the Abramoff revelations were strong. Nearly everyone was surprised by the amounts, huge by any standard. Abramoff's competitors wondered what he had done for the Indians to justify those fees. Many sensed the odor of malefaction, hardly an unknown aroma in Washington. One man, however, saw an opportunity. Gerald S. J. Cassidy, then sixty-three years old, had been a Washington lobbyist for three decades when he read that Post story. He had never met Abramoff, who was much younger than he and a product of the conservative Republican movement. Cassidy was a liberal Democrat whose circle of acquaintances did not include many brash young conservatives. But he knew about Abramoff, and envied his success. Abramoff's achievements at Greenberg Traurig came at a difficult time for Cassidy and the firm he ran, Cassidy & Associates. The same year-end statistics that recorded Greenberg Traurig's leap into fourth place in the standings of lobbying firms' revenues showed that Cassidy & Associates had fallen out of first place in 2003. News of that disquieting change appeared in Roll Call, a Capitol Hill newspaper, on February 25— three days after the first Abramoff story appeared in the Post: "Lobbying shop Patton Boggs replaced Cassidy & Associates as king of K Street last year. . . ." A quarter-century earlier, K Street was the location of many Washington lobbyists' offices; the name had become the city's favorite euphemism for the world of lobbyists. Gerald Cassidy had been in first place for many years, and he did not like being second. Not that he was in any apparent difficulty. The numbers that described Cassidy's business were all large. At the end of 1999 he had sold his firm to an international advertising and public relations conglomerate, the Interpublic Group, for a little more than $60 million. He continued to operate as an independent unit of IPG, and his fifty lobbyists continued to earn handsome fees. The "revenue number" for 2003, to use the argot of the profession, was $28 million. That was the total of fees paid to the Cassidy firm that were reportable under a law called the Lobbying Disclosure Act. When the numbers came out, Cassidy's spokesperson told Roll Call that the firm had received an additional $5 million in fees that weren't covered by the law, so the firm's income totaled more than $33 million that year. But there was no avoiding the fact that in the official standings, Cassidy had fallen out of first place. Soon after Abramoff was fired by his firm, he met Cassidy. "Mutual friends" encouraged them to explore the possibility of working together, Cassidy recounted. He declined to name anyone, but others said one who helped bring the men together was Arthur Mason, a vice president of Cassidy & Associates who was also a personal friend of Abramoff's. Mason acknowledged his role, but said he didn't think he was the only one who encouraged Cassidy and Abramoff to get together. In the lobbying world, nothing is more important than relationships. From a lobbyist's perspective the best business relationships are those that allow you to ask a favor. Scores of Washington lobbyists have such connections to members of the House and Senate who were once their colleagues, or whom they served as staff assistants. Others sustain such relationships with political help, particularly money contributed to the members' campaigns. But business relationships are not the only ones that matter. Washington is also lubricated by the grease of friendly acquaintanceship. Mason's relationships with Cassidy and Abramoff are both good examples. Mason, who was born in 1941, fought in the Vietnam War, winning a Silver Star and other decorations. In 1976 he ran for Congress in his native Massachusetts as the Republican challenger to Father Robert Drinan, a liberal Democrat. Drinan won, but by a smaller margin than usual. Mason then moved to Washington to practice law, where he got into trouble representing a New York ex-con and shady real estate operator named John P. Galanis. In 1987 Mason was indicted in New York State for real estate investment fraud related to Galanis's activities. Mason pleaded guilty to one charge and spent four and a half months in a New York prison. Later he was disbarred by the D.C. Superior Court, which found "a wealth of evidence of wrongdoing" in a case that cost defrauded investors millions of dollars. Affable, handsome, funny, and a good golfer, Mason had many friends. One was Sheila Tate, press secretary to Nancy Reagan, and to Vice President George H. W. Bush during the 1988 presidential campaign. Tate worked for Cassidy in a public relations firm he launched as an adjunct to his lobbying operation. She brought Mason into the PR operation in the early 1990s. His charm and ability to make friends quickly impressed Cassidy, a rather shy man. Cassidy decided Mason should become a lobbyist. Soon Mason was successfully plying that trade as a Republican in a firm dominated by Democrats. As an ex-con and disbarred lawyer whom Cassidy had restored to dignity and prosperity, Mason was grateful and loyal to his boss, and sang his praises. "I have to be very careful about what I ask Gerry for," he said once, "because he's such a good human being he'll do it." Mason's relationship with Abramoff was social, not professional. It reflected the fact that almost no one who works in Washington has roots in Washington. Throughout its history the city has been a magnet for lone adventurers who dreamed of making a mark. Abramoff, who grew up in California, and Mason, a native of the Boston area, were typical of the breed. Like thousands of others, they came to Washington without a long list of friends in the city to provide support, and made their way by building alliances. Such alliances can have many origins: people who worked for the same politician or in the same administration often remain friends and allies for life; southerners have always tended to band together; old school ties create bonds that endure; so do shared ethnicities. Abramoff and Mason were both Jewish. Abramoff was an observant Orthodox Jew; Mason was more relaxed about his religion. But when his daughter married an Orthodox Jew, according to several friends, Mason turned to Abramoff for advice on how to deal with his new son-in-law. This led to their relationship, a Washington kind of friendship. "Arthur was snowed by Jack," according to one former colleague— the more so after Abramoff treated him to a half-day golf lesson from Mitchell Spearman, known as America's most expensive golf instructor (fee: $600 an hour). Another colleague recalled Mason arriving at work at Cassidy & Associates one Monday morning in autumn, "bragging that he had been in Jack Abramoff's box at FedEx Field" for a Washington Redskins football game the day before. The colleague remembered Mason's enthusiasm: "There were senators there!" Mason liked Signatures, the restaurant on Pennsylvania Avenue that Abramoff owned and used to court the powerful and reward his friends. In March 2004, when Abramoff unexpectedly found himself a free agent, he told friends he didn't want to work again for a big law firm; he would prefer a straight lobbying operation like Cassidy & Associates, which might be "the only firm big enough" to take him and his group of lobbyists on, he told one person. Abramoff spoke with Mason at this time to ask if there was any interest at Cassidy in him and his team. A meeting between Abramoff and Cassidy was soon arranged. Employees at Cassidy & Associates noticed the short, dapper Abramoff's arrival one day that month. Mason ushered him down the gold-hued carpet of Cassidy's pretentious, Federal-style offices on 13th Street in downtown Washington, to the proprietor's corner office. Abramoff had nothing on Cassidy in the dapper department that day. The older man, whose barrel chest and broad shoulders were reminders of his high school football career, wore one of his flashy suits custom-made by Alan Flusser, one of New York's most estimable tailors. Flusser's suits cost $3,800 and up. Cassidy favored double-breasted pinstripes and bright silk ties that gave him the appearance of a snazzy defense lawyer for celebrity clients, or the owner of a Las Vegas resort. He carried himself with a self-conscious body language that suggested caution. His favorite pose was prayerful, all ten fingers touching, hands pointed upward. Cassidy's office was decorated with fine antique reproductions; guests were seated on an Empire-style sofa with a high back, beneath a handsome copy of a Gilbert Stuart portrait of George Washington. As Cassidy once explained, all this had a purpose. When potential clients met him, he wanted them to have the impression that they "ought to be paying me a lot of money." Cassidy proposed an arrangement that would bring three of Abramoff's associates and many of his clients from Greenberg Traurig to Cassidy & Associates. Abramoff would be a "consultant" to the Cassidy firm. His compensation would consist of a nice percentage of whatever fees his clients who moved their business to Cassidy paid to their new lobbyist. Abramoff would have an office in the building that housed Cassidy and his affiliates. * Cassidy generously gave many hours of interviews for this book. Excerpted from So Damn Much Money by Robert G. Kaiser Copyright © 2009 by Robert G. Kaiser. Excerpted by permission of Knopf, a division of Random House, Inc. All rights reserved. No part of this excerpt may be reproduced or reprinted without permission in writing from the publisher.